Amputees living in rural areas, often have no acces to prosthetic devices and care. We are looking for ways to provide prosthetics to people living in rural areas. These activities have been started under the name MoveAid. Since 2014, MoveAid and the Movendi Foundation joined the forces. The results of a joint project with Exceed Indonesia and Össur resulted in a scientific publication in the Journal of Prosthetics and Orthotics International. The aim of the study was to evaluate the patient’s performance and satisfaction with the use of the modular socket system, and the technical feasibility of its implementation in a rural setting. 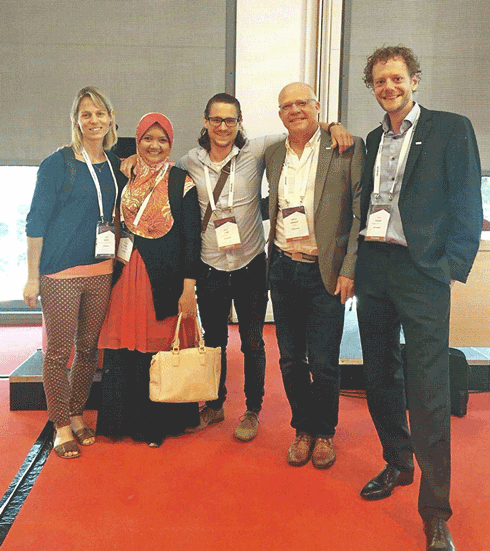 The Community of prosthetics practice was launched at June 24th at the ISPO World Conference in Lyon, and is part of the GATE initiative of the WHO. The overall aim is to develop and provide a holistic approach to prosthetic rehabilitation and service delivery for people with lower limb amputations who live in rural areas. The Dutch journal ‘Orthobode’ published an article about the start of the CoPP. Between July and November 2014 Floor was in Indonesia to evaluate Bob Giesbert’s project on the delta cast protheses; also known as the pontas prostheses. There was concluded that the quality of the delta cast material and the delta cast prostheses was sufficient. From the interviews with the P&O professional and the experiences with the mobile workshop so far, it appeared that the production process in which a positive mold is still used, needs to be improved. Click here for a brief report of Floor her findings. With a mobile workshop people in poor, rural areas can also be provided with proper rehabilitation care. Multiple organizations in developing countries are ambitious about creating a mobile workshop but still no effective examples exist (to our knowledge). Carrie Wismans went to Puspadi (Yakkum Bali) on Bali, Indonesia to find out what the challenges and opportunities are of a mobile workshop for Puspadi. One of her conclusions is to provide not only lower leg prostheses from this mobile workshop, but also ankle foot orthoses (AFO). 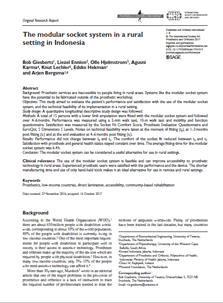 Eline Kolk and Bob Giesberts went to Indonesia in December 2012 to set up this pilot study. Together with Harapan Jaya (North-Sumatra), DARE Foundation (Jakarta) and Puspadi (Bali) they evaluated the concept and developed a testing plan. Twenty people will be using the developed prosthesis for one full year. During this peroid they will do several tests to test the quality and user satisfaction. The DARE Foundation is producing the prostheses and executing the tests. As his Master’s thesis, Bob Giesberts developed a lower leg prosthesis (Indonesian Kaki Palsu) that can be produced in a mobile workshop. He went to Harapan Jaya in North-Sumatra, Indonesia to further develop and evaluate his design together with Pontas. Together they made fifteen prototypes for three people to be tested for just a few days. The result of this project is a well defined design that can be used for further testing. Click here for Bob his MSc thesis report and click here for a summary report. In a developing country like Indonesia it can be very difficult to get proper rehabilitation care like a lower leg prosthesis. Arjen Bergsma went to Indonesia to find out what makes it so difficult to get a lower leg prosthesis. Using the feedback information of multiple local organizations he concluded that availability is mostly hindered by the long distances patients have to travel and the time they have to be from home. He suggests to create a mobile workshop to bring the product to the people. Click here for the report about this project.